When I use a word, Humpty Dumpty said, in rather a scornful tone, it means just what I choose it to mean – neither more nor less. What can lobbyists do when science contradicts their political messages? Some simply deny the science, as many conservatives do with climate change. Others pretend to embrace the science, while ignoring or purging the disagreeable content. 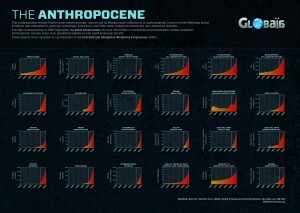 That’s what the Breakthrough Institute (BTI) is doing with one of the most widely discussed issues in 21st century science, the proposal to define a new geological epoch, the Anthropocene. In BTI’s simplified pop version, to which they’ve assigned catchier label ecomodernism, there is no “may” about it – their literature consistently couples a professed concern for the environment with rejection of actual pro-environmental policies, on the grounds that new technology, growth and capitalism are the only solution to all environmental concerns. In 2004, Shellenberger and Nordhaus wrote a notorious pamphlet, The Death of Environmentalism. That title wasn’t an announcement – it was a goal. They declared their conviction “that modern environmentalism … must die so that something new can live.”5 Their organization has worked to achieve that death ever since. Bill Blackwater has exposed the “self-contradictions, simplistic fantasy, and the sheer insubstantiality” of BTI’s thought, and John Bellamy Foster has shown that ecological modernization theory involves “a dangerous and irresponsible case of technological hubris [and] a fateful concession to capitalism’s almost unlimited destructive powers.”6 In this article I examine one specific feature of BTI’s current activity: its attempt to hijack the Anthropocene, to misrepresent one of the most important scientific developments of our time so that it seems to serve Breakthrough’s anti-environmental agenda. Given the huge difference in views, it would have been appropriate and honest for BTI to declare how and why it disagrees with the scientists who have identified profound changes in the Earth System and are proposing to declare a new epoch. Instead, when the word Anthropocene started appearing frequently in academic journals and mainstream media, Nordhaus and Shellenberger jumped on the bandwagon and tried to steer it in a direction more congenial to their views. In contrast to scientists they deem to be depressing, pessimistic, and catastrophist, they declared that the Anthropocene isn’t a crisis, it’s an opportunity to build a global technological utopia, in which humanity embraces nuclear power and shale gas, and we all enjoy US-style consumerism forever. What they offer is a homeopathically diluted Anthropocene, in which the only remaining trace of Earth System science is the fact that the Earth is dominated by human activity – and even that, BTI insists, is neither a recent development or a matter for concern. Read that again. If it’s true, then there is no case for declaring a new epoch. There has been no qualitative change, so we are still in the Holocene, still doing what humans have always done, since long before the ice sheets retreated. Landscape ecologist Erle Ellis, a Breakthrough Institute Senior Fellow, has been arguing for the “scope and scale, not kind” view in the Anthropocene Working Group, the international committee that is evaluating the proposal for a new geological epoch. He supports an early Anthropocene – the view that the Anthropocene began not recently but thousands of years ago, when humans first made large-scale changes to landscapes and ecosystems. Official endorsement of an early date would strengthen the Nordhaus/Shellenberger claim that there is no qualitative break between current and past human impacts on the Earth. As Clive Hamilton and Jacques Grinevald write, the early Anthropocene option justifies a business-as-usual understanding of the present. BTI’s website describes Ellis as “a leading theorist of what scientists increasingly describe as the Anthropocene,”16 but doesn’t mention that his early Anthropocene position, while compatible with BTI’s philosophy, has little support among the other scientists involved. 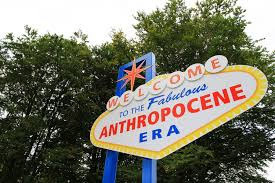 Breakthrough has invited influential environmental writers to a luxury California resort in June, all expenses paid, for a two-day seminar on “The Good Anthropocene.”20 So don’t be surprised if articles using that oxymoron appear in the mainstream media this summer. Phrases like “unprecedented and unsustainable” will not be emphasized, if they appear at all. Yes, you read that right. BTI’s pseudo-Anthropocene requires deliberately expanding the metabolic rift between humanity and the rest of nature into a permanent chasm. After all, “humans have remade the world for millennia,” so more of the same must be good. A striking feature of all BTI propaganda is the gulf between the concrete problems they admit exist and what Bill Blackwater calls “the daydream quality of their positive solutions.”22) That is clearly on display in their Ecomodernist Manifesto, which proposes to solve the pressing problem of climate change with “next-generation solar, advanced nuclear fission and nuclear fusion” – technologies that don’t exist and won’t soon arrive. In the meantime, BTI proposes reliance on hydroelectric dams, which can cause major environmental problems, and on carbon capture and storage, which doesn’t exist in any practical form. The pundits, politicians and CEOs whose interests are served by the Breakthrough Institute don’t want to be identified with the science deniers of the far right, but neither do they want the radical measures that responding to the real Anthropocene requires. BTI’s fantasy of a Good Anthropocene builds the illusion that both objectives are easily achieved. Don’t worry, be happy – technological ingenuity will save capitalism from itself. BTI could have avoided mentioning the Anthropocene, but that would have left a widely discussed concept unchallenged, posing the possibility that public understanding of the state of the Earth System will grow, strengthening the environmentalism that BTI wants to kill. It’s far more effective to appropriate the word, to sow confusion by promoting a caricature that has nothing to do with the actual Anthropocene and everything to do with preserving the status quo. There can be no question about which side the left is on in this conflict. We may not endorse every element of the Anthropocene project, but we must not allow Earth System science to be hijacked and misused by enemies of the environment. As Dipesh Chakrabarty writes, the scientists whose work BTI is trying to undermine “are not necessarily anticapitalist scholars, and yet clearly they are not for business-as-usual capitalism either.”23 Many are adopting more radical views as they study what’s happening to the Earth System. It’s our responsibility to help them blow away Breakthrough’s fog of confusion, and work with them to stop capitalism’s drive to ecological disaster. Ian Angus is an ecosocialist activist and editor of the online journal Climate and Capitalism. He is co-author, with Simon Butler, of Too Many People? Population, Immigration and the Environmental Crisis (Haymarket, 2011), and editor of the anthology The Global Fight for Climate Justice (Fernwood, 2010). Read other articles by Ian, or visit Ian's website. This article was posted on Friday, May 22nd, 2015 at 3:09pm and is filed under Capitalism, Environment, Science/Technology.